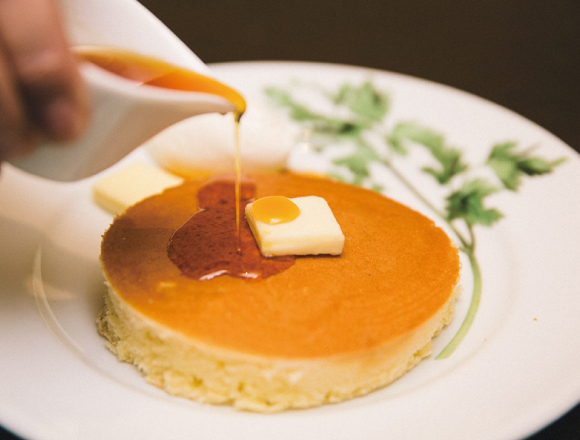 6 Recommended Cafés for Pancakes in Harajuku—A Change From Crepes! Hi, everyone. Ellie here from the MOSHI MOSHI BOX Harajuku Tourist Information Center. Recently at the MOSHI MOSHI BOX we’ve had a lot of people, guys and girls, come in saying that they want to eat some tasty pancakes in Harajuku. So today, I’m here to recommend some shops that sell pancakes around Harajuku. “Café Casa” is a long-standing shop whose flavours have remained the same, serving to parents and children through the generations. Everything from the signboard to the illustrated menu and stained glass window created by the owner will leave you feeling cozy. The colour green envelops the café against other vivid colours. Due to customer demand the hot cakes sold there (￥750) have been a familiar item on the menu for almost 20 years. The contrast between the crunchy outside and fluffy inside is exquisite. They’re different from your usual pancakes and have a nostalgic feel to them. Combine them with maple syrup and you’ve got yourself a truly delicious treat. This stylish café can be found by walking from Harajuku Station down Takeshita Street for about 5-minutes. When you reach the end, turn right and look for the green signboard. The main food on the menu is pancakes, all of which are made with the best ingredients and made one-by-one after an order comes in. 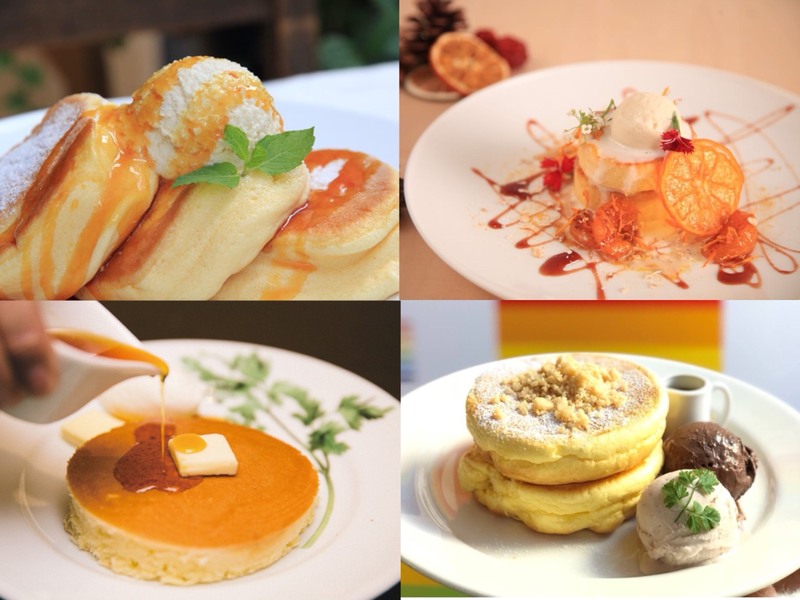 The most popular and recommended item on the menu is the fluffy “Premium Pancake” (￥950). The soft pancake wobbles as the waiter brings it over – it looks like it will collapse just by being placed on the table. Eat this to experience the fluffiest and softest texture you have ever eaten. Bills serve the world’s most famous breakfast and were responsible for causing Japan’s pancake boom. Located in Tokyo Plaza Omotesando Harajuku, the shop’s Australian Ricotta Pancakes. Spread underneath the thick pancake are slices of fresh banana which you eat together with honey comb butter and maple syrup. The marriage between the salty ricotta cheese and sweet syrup is to die for. “Jinguen” is a gallery café located in Ura-Harajuku. Recommended from their menu are their thick homemade hot cakes. The outside of the hot cake is crisp while the middle is silky smooth. Of course, they go really well with maple syrup. You can also add vanilla icing, whipped cream, and chocolate or strawberry sauce. This café is just a one-minute walk from Meiji Jingu Station via Tokyo Metro on the second floor of YM Square. It has tall glass windows which open up the shop and give you a sense of space. Their original “Manly Pancakes” draw a line between standard pancakes and the recent emerging thick and fluffy pancakes to unveil an original and unique texture. The subtle flavour of the eggs make the pancakes melt-in-the-mouth and match perfectly with syrup and fresh cream. This place’s specialty menu item is their Honolulu Pancakes. They’re incredibly thick, with a crumbly outside and soft middle. These luxurious pancakes have a special flavour made for adults. They are drizzled with butter and fresh cream, and you can choose sausages or bacon to go with them. Eating them with your choice of honey or maple syrup is simply irresistible! Did you like this list? 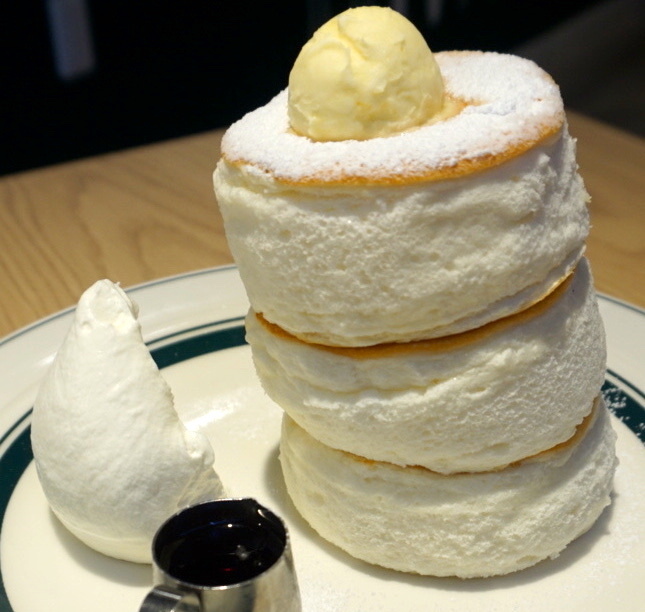 Try and find your favourite pancakes while in Harajuku! 【Tokyo Cafe】At the heart of trendy Omotesando sits the old, unchanged Café Casa. Take a bite into the past and try the must-eat hotcakes!